Some shuffling of things that usually are in the dining room has limited access to the LPs in the office. Only the top shelf in one of the racks is easy to reach, so tonight’s selection on The Midnight Tracker comes from the beginning of the alphabet. In 1983, with Bruce Springsteen and the E Street Band between albums and tours, sax player Clarence Clemons put together a band on the side. 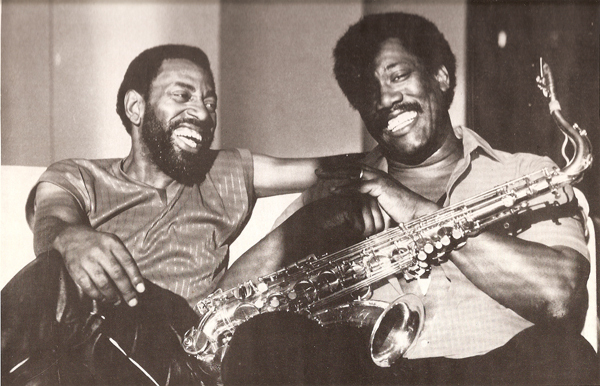 Clarence Clemons and the Red Bank Rockers — named for Red Bank, New Jersey, where Clemons briefly owned a club in the early ’80s — put out one record. “Rescue” is full of spirited, blue-collar R&B and rock, the kind you’d hear from a bar band. Which is exactly what the Red Bank Rockers appeared to be, albeit with one well-known sax player. On this record, Clemons wisely leaves the lead vocals to John “J.T.” Bowen, whose wonderfully rough voice is reminiscent of Springsteen, Wilson Pickett and any number of R&B shouters. We know plenty about Clemons, thanks to his work with Springsteen, but Bowen is a bit of a mystery man. In this 1986 interview, Bowen discusses his career in a way that suggests a guy who’s struggling to make it, in any number of ways. He’s seemingly a guy regionally known — he says he’s from Crisfield, Maryland, crab capital of the world — who never got a bigger shot at the spotlight. Al-Vis, a veteran Asbury Park guitarist, wrote earlier this year that Bowen is believed to have died some years ago. On “Rescue,” though, J.T. Bowen is young and vibrant, a strong complement to Clemons’ considerable talent. That said, I hadn’t listened to it in a long time and couldn’t remember any of the cuts, save for “Resurrection Shuffle,” the old Ashton, Gardner and Dyke hit from 1971. Maybe that’s why I bought it all those years ago. So how does “Rescue” hold up? Does it appeal to anyone besides Springsteen completists? I’d say nicely and yes. After giving it another spin, “Rescue” is now what it was then — a pleasant way to spend 45 minutes. It’s the kind of energetic R&B and rock to which you can kick back and enjoy a cold one, or get up and dance if so inclined. Can’t ask for much more. 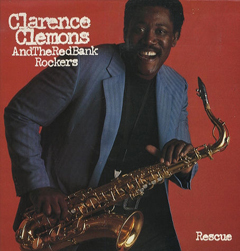 “A Man In Love,” “Heartache #99,” “Savin’ Up” and “Resurrection Shuffle,” Clarence Clemons and the Red Bank Rockers, from “Rescue,” 1983. This is Side 2. It runs 17:28. It’s out of print. Clemons co-wrote the first two cuts. “Savin’ Up” is a Springsteen cover, with The Boss on rhythm guitar. Clemons recorded three more solo LPs from 1985 to 1995, but never another with the Red Bank Rockers. If you’d like to hear more of Clarence Clemons and the Red Bank Rockers, Wolfgang’s Vault has live shows from a Philadelphia club on Nov. 25, 1983 (early and late shows) and on Jan. 22, 1984.